Hoping to avoid damage from Hurricane Matthew, one aeronautical university in Florida decided to fly more than 60 of its planes to Auburn University Regional Airport this week. Meanwhile, officials report that local hotels are filling up fast from those who evacuated ahead of the hurricane's anticipated path up the East Coast. 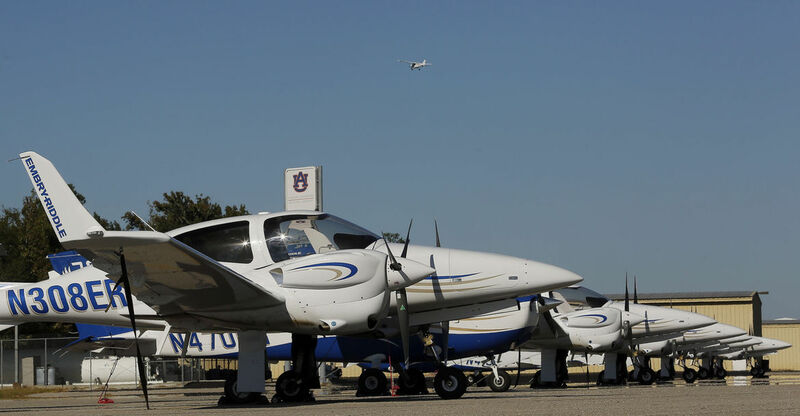 Since Wednesday night, Auburn University Aviation has been offering assistance to the students and flight instructors from Embry Riddle Aeronautical University’s Daytona Beach campus. Bill Hutto, airport and aviation center director, said the Florida university brought in 15 of its planes Wednesday night and 45 Thursday morning. The staff at the airport and aviation center helped the university with finding hotel rooms. “We’re glad to help,” Hutto said. Auburn University also is offering tours of the Wellness Center and other areas on campus to the Florida group. Hutto said the Florida university is one of Auburn's peer institutions. “We lend a helping hand,” Hutto said. James Roddey, director of communications at Embry Riddle Aeronautical University’s Daytona Beach campus, said their original plan was to have some planes in the hangar at Daytona International Airport and fly some twin-engine planes away from the campus, but decided against it. “We changed the plan and wanted to be as safe as possible,” Roddey said. The campus has 150 flight instructors and 1,200 to 1,500 flight students, according to Roddey. It conducts 275 flights a day. Roddey expressed his appreciation to Auburn University’s airport and aviation center. Roddey said they hope to head back to Florida on Saturday. As Florida along with Georgia and South Carolina brace for Hurricane Matthew, Alabama should remain out of its path, according to Jim Stefkovich, meteorologist in charge at NOAA (National Oceanic and Atmospheric Administration)’s Birmingham office. Rita Smith, public information officer for the Lee County Emergency Management Agency, said it is closely monitoring the hurricane in case anything changes. Smith recommended that residents monitor the hurricane’s path as well through their NOAA radios and local media. People coming to the Auburn-Opelika area to avoid the hurricane were filling up the hotels Thursday. Barbara Patton, president of the Opelika Chamber of Commerce, said the city’s hotels were full by late afternoon Thursday. Gov. Robert Bentley, at a public appearance in Alexander City, said officials are in contact with the states that will be affected by Hurricane Matthew.